The awarding of this year's Nobel Peace Prize to the International Campaign to Abolish Nuclear Weapons is resonating in the Marshall Islands, boosting hopes there will no longer be a repeat of its exposure to radiation as happened when the United States conducted almost 70 nuclear tests here from 1946 up to 1958. “I am very glad for ICAN, that they received the recognition. I think a nuclear ban treaty is a realistic long-term goal,” President Hilda Heine told Kyodo News in the Pacific island-nation's capital Majuro, in an interview ahead of last Sunday's award ceremony that took place in Oslo, Norway, some 12,400 kilometers away. “It gives countries like the Marshall Islands hope that perhaps, in the future, we would be able to eliminate nuclear (weapons) in the world,” she said. ICAN, a coalition of nongovernmental organisations from around 100 countries that was founded in 2007 in Australia, was recognized by the Nobel Committee for its efforts that led to the adoption at the United Nations earlier this year of the Treaty on the Prohibition of Nuclear Weapons. The treaty, however, still runs short of the required ratification by 50 countries for entry into force, nor does it have the backing of major powers and nuclear weapon states. Citing data from the Federation of American Scientists, ICAN said close to 15,000 nuclear weapons are possessed by the United States, Russia, Britain, France, China, India, Pakistan, Israel and North Korea. “It's disappointing that those nuclear-armed countries are not supportive of the treaty,” lamented Heine whose country, located near the equator in the Micronesia region of the Pacific Ocean, was chosen by the United States as a nuclear test site after World War II, at which time it was under U.S. administrative control. Among the 67 tests carried out here, the most powerful and most destructive was the Castle Bravo Test on March 1, 1954 on Bikini Atoll, which exposed some islands and their residents, as well as the crew of a Japanese fishing boat, to nuclear radiation. “Nuclear should be a concern for every country. We had our experience with the nuclear testing, and we know what it can cause, and the effects on the lives of people and property,” Foreign Minister John Silk said in a separate interview. “That's a very hopeful thinking, but I think that's what everybody wants to see at the end -- a world without nuclear weapons,” he said. Having been exposed to radioactive fallout on her home island of Rongelap, northwest of Majuro, 69-year-old Nerje Joseph could not agree more. 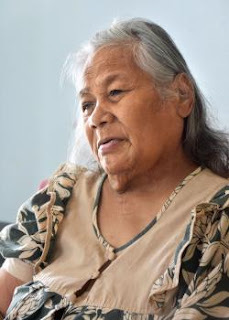 “They took us away (from there) and destroyed our place, our home,” Joseph said of the Americans, in an interview with Kyodo News at a home provided for her close to the western tip of Majuro Atoll. Heine said the Marshall Islands, which created this year a National Nuclear Commission to develop a strategy and plan of action for pursuing justice, will continue to assert to the U.S. government the concerns of the Marshallese people, and also work with the United Nations. “We think that the settlement is not enough. We think that the U.S. government still owes the Marshallese compensation for their lost land -- the fact that people are not back to their land, they are still nomads in their own country, and also the fact that we have high rate of cancer,” Heine said. It has extended more than US$604 million in compensation to affected communities, while a US$6.3 million worth of services is annually provided under the Department of Energy Special Medical Care Program and the Environmental Monitoring Programme. Radiation victim Abon, who worries about the future of her seven children and more than 10 grandchildren, remains pessimistic about the prospects for a nuclear-free world "as long as there are selfish people in the world -- those that know they have the power, they are smart, and they want to strive to be No. 1." But the leader of the tiny nation of around 40,000 people spread across 29 low-lying coral atolls and five islands, with another 20,000 in the United States, sees a glimmer of hope with ICAN's influential efforts. “The advocacy and the work that ICAN is doing should continue because I think in the long run, people may change their opinions. If they push the countries to change their opinions, perhaps, there is a future, there is a hope that nuclear-armed countries can actually agree to stop,” Heine said.